In the main document, we first load the xr package. Next, we have to let the package know in which external document to look for labels. To do that, we use the name of the tex file, without ending. If the document is located in a different folder, we can use the absolute or relative path to the file. If there are multiply-defined labels in the main document and/or the external document(s), LaTeX will throw a warning in the log: ” There were multiply-defined labels”. A possible solution is to find and replace all multiply-defined labels, either in the main or in the external document. That’s a bad idea for multiple reasons. The xr package offers a more elegant approach. It allows adding a prefix to each external document. The prefix is defined by passing an optional argument to \externaldocument. In a scientific article, one often marks references to supplementary materials with an S (as in Supplementary Figure S1). 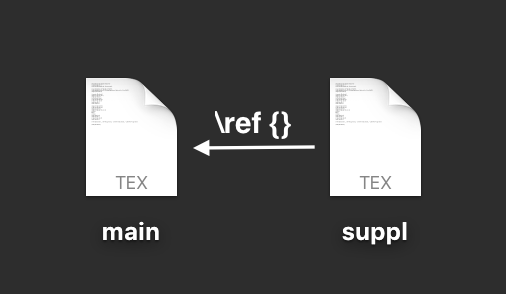 To simplify referencing of supplementary materials, it might be a good idea to define special \ref commands that print references in the appropriate format. Some example commands are provided below. It is important to always typeset the external document first. Also, when the external document changes, both documents have to be re-processed. Use latexmk to automate the build process. Referencing external documents introduces dependencies. Keep that in mind when you move files around or send them to collaborators or editors. External references are loaded from the aux-file of the external document. If you clean up the directory after typesetting, you won’t be able to properly reference content from an external document. Finally, to get the reference number right, the document always has to be processed twice, for example using pdflatex.